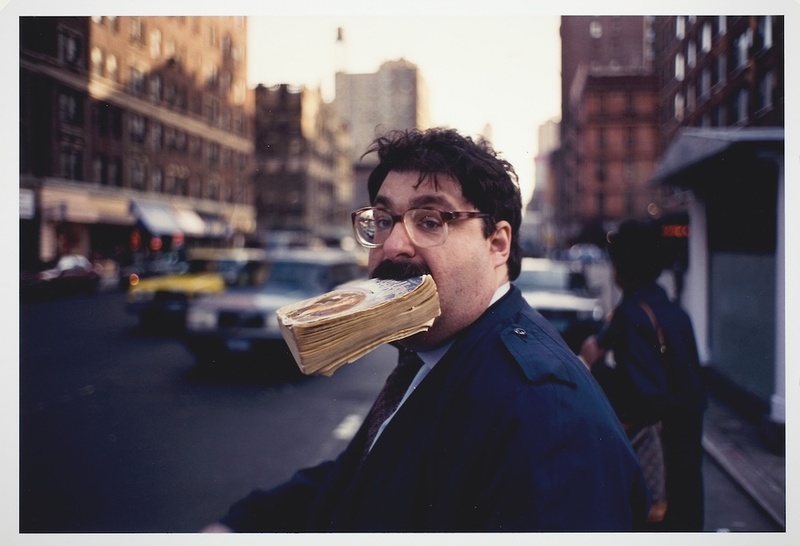 Book in Mouth, New York City by Jeff Mermelstein (1993). Courtesy of the Art Institute of Chicago. In our hunt for the most eclectic stories and ideas of the day, we come across a lot of great writing, and our holiday season gift to you is this list of some of the gems we found over this year. Are you looking for a biography or memoir that will surprise and delight you—maybe about a person you thought you’d figured out long ago? How about a story by a scientist that will help you pepper your holiday party conversation with extremely weird facts? Or a book of history that will turn your worldview upside down? If so, you’re in luck: Zócalo Public Square’s top 10 nonfiction books (plus one) of 2018 are all this and more. Ethan Kytle and Blain Roberts’s Denmark Vesey’s Garden: Slavery and Memory in the Cradle of the Confederacy goes beyond the broad strokes of what we know about racism and the South’s post-Civil War history: Reconstruction, Jim Crow, segregation, the civil rights movement. But how did that become a national narrative? How did the stories white Southerners tell themselves about their past come to be, and what was the truth of life on the ground for blacks in the decades after slavery ended? California State University, Fresno historians Kytle and Roberts use the history of the city of Charleston, from 1865 through the 2015 murder of nine people at the historic Emanuel A.M.E. Church (which was founded by legendary local black abolitionist and rebellion organizer Denmark Vesey), to explore why slavery’s legacy remains so contested throughout the nation. If your mind boggles when you think of how long the Confederate flag flew in South Carolina, and why it still flies elsewhere, this is necessary reading. Michael S. Gazzaniga’s The Consciousness Instinct: Unraveling the Mystery of How the Brain Makes the Mind starts with a provocative idea: “Consciousness is an instinct.” Gazzaniga, director of the SAGE Center for the Study of the Mind at UC Santa Barbara and one of our greatest neuroscientists, has written a book that is part history of science and part meditation on the processes in our brains that make us human. Gazzaniga, whose research has helped us understand the brain’s cerebral hemispheres (which the left and right brains control), synthesizes complex data for laypeople with ease, unpacks the musings of thinkers from Aristotle to William James, and offers his own theory of the relationship between the brain and the mind. It’s a window both into why all humans think and behave in certain ways, and how this particular human’s beautiful brain works. Alfredo Corchado’s Homelands: Four Friends, Two Countries, and the Fate of the Great Mexican-American Migration goes well beyond the weekly headlines about conflict on the U.S.-Mexico border. Before the wall was even a twinkle in Donald Trump’s eye, journalist Alfredo Corchado was reporting about life on both sides of the border, and the cultural, economic, and political shifts in the relationship between these two nations, which also happen to be his homelands. His father moved from Mexico to California in the 1960s, as part of the bracero guest worker program; Corchado and the rest of the family soon joined him in the U.S. The 40-year history of migration covered in Homelands is framed by Corchado’s story and his friendship with three men—two fellow immigrants and a New Mexico-born Latino—he meets while working as a reporter in Philadelphia in the 1980s. Corchado achieves a unique meld of vivid, deeply personal storytelling, meticulous reporting, and clear, concise explanations of the impact of both political and economic policies. Sue Prideaux’s I Am Dynamite! A Life of Nietzsche is an eminently readable and surprisingly funny biography of the famously iconoclastic philosopher. As depicted by English novelist and biographer Prideaux, who draws heavily on his writings (both published and personal), Nietzsche is an eccentric young man with missing trousers, a heartbroken lover—and a philosopher of great sensitivity and foresight. She effectively explains how politicians on both sides of the aisle—but especially nationalists like his sister, Elisabeth—have interpreted and twisted his writings to suit their needs. And she compassionately explores his final years, when he suffered from debilitating mental and physical illnesses. From the surprising exclamation point of the title (a quote from Ecce Homo, Nietzsche’s final published work and his version of an autobiography) to its final pages, this delightful biography is almost as iconoclastic as its subject. Martha S. Jones’s Birthright Citizens: A History of Race and Rights in Antebellum America came out on the 150th anniversary of the 14th Amendment, which granted “all persons born or naturalized in the United States” citizenship, including former slaves. But when Johns Hopkins University historian Jones and her publisher planned the release of Birthright Citizens, they could not have known just how timely this story would be. Just weeks later, the Trump administration heightened its attack on birthright citizenship, which, Jones explains in this fascinating history, evolved out of necessity for African Americans beginning in the early 1800s. Jones traces the legal battles that led to the 14th Amendment’s passage and the interpretations of the law that followed. If you want to understand the debates that are tearing our country apart right now, you must start here. Elaine Pagels’s Why Religion? A Personal Story is the story of a spiritual journey before and after tragic events. Pagels became a rock star of religious scholarship with the 1979 publication of The Gnostic Gospels, which upended the world’s understanding of early Christianity through a reconsideration of a trove of manuscripts once considered heretical. She has since had a marvelous professional career but has also endured unimaginable personal tragedy: In 1987, her six-and-a-half year-old son died of a rare lung disease, and a year later her husband died in a climbing accident, leaving her a widow with two young children. Why Religion? chronicles her evangelical teenage rebellion (her parents were determinedly secular) and the friendship she developed with Trappist monks in Colorado after her son’s and husband’s deaths. But it also offers an interesting alternative to narrow, contemporary views of religion and belief. Alexis Clark’s Enemies in Love: A German POW, a Black Nurse, and an Unlikely Romance tells the story of Elinor Elizabeth Powell, who grew up black and well-to-do in a progressive Boston suburb in the 1920s and 1930s, and had managed to avoid discrimination and prejudice—until she joined the U.S. Army as a nurse in 1944. Stationed in Arizona, she encountered Jim Crow laws for the first time and also fell in love with the man who would become her husband: Frederick Albert, a German prisoner of war. Journalist Clark tells an engrossing love story that is also a global depiction of the struggles of interracial relationships in the 20th century, as the couple moves around the U.S. and eventually to Germany and back to find a community that will welcome their family. Marcia Bjornerud’s Timefulness: How Thinking Like a Geologist Can Help Save the World is an antidote to the new climate report (not to mention raging fires and floods around the world) that seems bereft of hope for humanity’s future. Lawrence University geologist Bjornerud has a compelling alternative: take the long view. The really, really long view. She and her fellow geologists don’t look a year or 10 into the future; they look centuries backward and forward, at the amount of time it, say, takes a mountain to erode. Bjornerud argues that if we all can change the way we view our world and our place in it, adopting an approach grounded in “timefulness,” we’ll be able to create a more sustainable future not just for ourselves and the next generation but for many generations to come. Huw Lewis-Jones’ The Writer’s Map: An Atlas of Imaginary Lands is a beautiful book that collects writers and storytellers’ musings on the maps that inspired them and the maps of the worlds they created, along with the maps themselves. How was “The Marauder’s Map” created for the Harry Potter films? What medieval map inspired David Mitchell to create his own maps for Cloud Atlas? What impact do the imaginary maps in children’s books have on their readers? Lewis-Jones, a historian who has written extensively about exploration, has crafted an incredible love letter to invention, place, and the art of the map. Sandeep Jauhar’s Heart: A History tells the story of how, at age 45, cardiologist Jauhar received a diagnosis of blocked arteries. The event inspired him to combine his family’s and his own health history, the stories of the patients he’s treated over the years, and the history of heart research. The stakes are always life or death, and the suspense is always high in the riveting anecdotes Jauhar chooses from the annals of medicine, including doctors trying to heal themselves and early open-heart surgeries. Jauhar’s history is full of colorful stories and fascinating facts…but it also has a lot of heart.